This article is part of the Center for Media and Democracy's special report, Fake TV News: Widespread and Undisclosed. Click here to read the report summary. WCPO-9 is a Cincinnati, Ohio television station and an affiliate of the ABC television network. 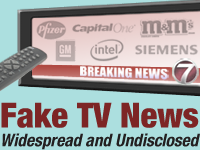 Diane Farsetta and Daniel Price, "Fake TV News: Widespread and Undisclosed: A multimedia report on television newsrooms' use of material provided by PR firms on behalf of paying clients", Center for Media and Democracy, April 6, 2006. John Kiesewetter, "Channel 9 scolded for not citing sources," The Enquirer (Cincinnati, Ohio), August 20, 2006. This page was last edited on 11 October 2017, at 21:27.